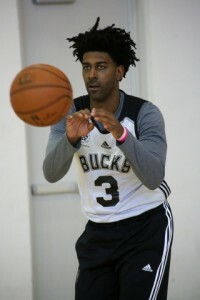 Milwaukee Bucks guard O.J. Mayo was fined $25,000 by the N-B-A for his actions in Saturday night’s game against the Minnesota Timberwolves at the Target Center. Mayo was fined for aggressively pursuing a game official and failing to leave the court in a timely manner upon his ejection. 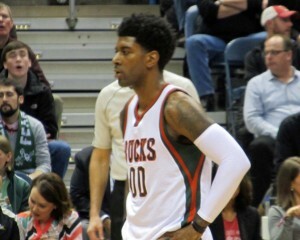 Mayo picked up two technical fouls for protesting a non-call in the first quarter of the Bucks’ 95-85 victory. He had to be restrained by coaches and teammates. After Saturday’s game, Mayo said he was tired of fouls not being called against Bucks opponents. Mayo said the Bucks were leading the league in points in the paint and hinted the team deserved more respect from officials. The Bucks are back home at the Bradley Center tonight to host San Antonio. It was a better effort, but the Milwaukee Bucks still dropped their 11th straight road game, falling 103-90 to the Los Angeles Clippers at Staples Center. Chris Paul scored 21 points and dished out eight assists for the Clippers (16-10), who swept the season series from the Bucks (10-17). J.J. Redick added 19 points for the Clippers. 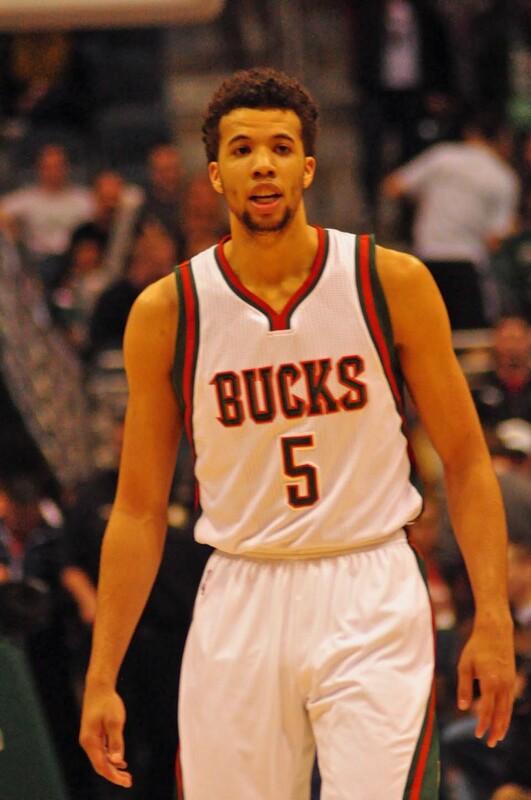 Michael Carter-Williams returned to the starting lineup for the Bucks. He and fellow guard O.J. Mayo led the way with 17 points each. Coach Jason Kidd was happy with his team’s energy, compared to the lack of it the night before in a loss to the Lakers. Paul Pierce scored six points for the Clippers and became the 16th player in NBA history to pass the 26,000 point mark. The Milwaukee Bucks trailed by four points with 22 seconds left, but they didn’t quit. O.J. Mayo hit a three-pointer to cut the Portland’s lead to one with 16.8 seconds left. Then Michael Carter-Williams forced a jump ball and won it. Carter-Williams then found Greg Monroe for the go-ahead layup with 5.1 seconds left. Portland has one chance to tie it or win it, but Meyers Leonard’s short jump shot was blocked by center John Henson. Carter-Williams made one of two free throws after being fouled and the Bucks held on for a 90-88 victory, their second straight. Giannis Antetokounmp led the Bucks with 17 points while Greg Monroe added 16 points and 12 rebounds. O.J. Mayo added 15 points, with eleven of the 15 in the fourth quarter. Portland (9-13) struggled to make shots in the first half and went one for 15 from three point range. The Trailblazers started to heat up in the second half and made it a close game the rest of the way. Damian Lillard had 23 points to lead the Trail Blazers. 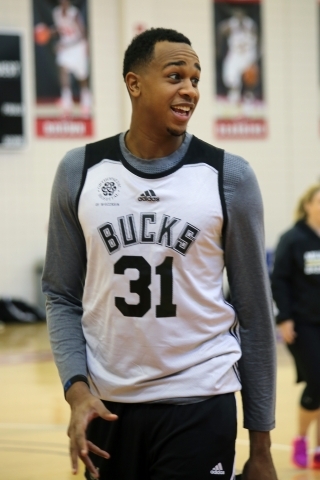 Today is a practice day for the Bucks, who will host the Los Angeles Clippers on Wednesday night. With three guards sidelined by injuries, veteran O.J. 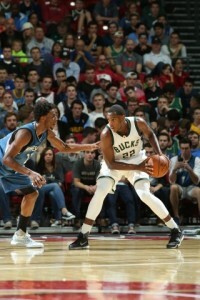 Mayo came off the Milwaukee bench to score a season high 17 points, leading the Bucks past the New York Knicks 106-91. Michael Carter-Williams also scored 20 points to help the Bucks break a two-game losing streak. Greg Monroe added 18 points and 14 rebounds. Giannis Antetokounmpo and Jabari Parker added 17 points each. The Bucks put together a run of 15-straight points in the third quarter to give the Bucks a cushion. Carmelo Anthony led the Knicks with 18 points. The Bucks will host the Portland Trailblazers on Monday night. 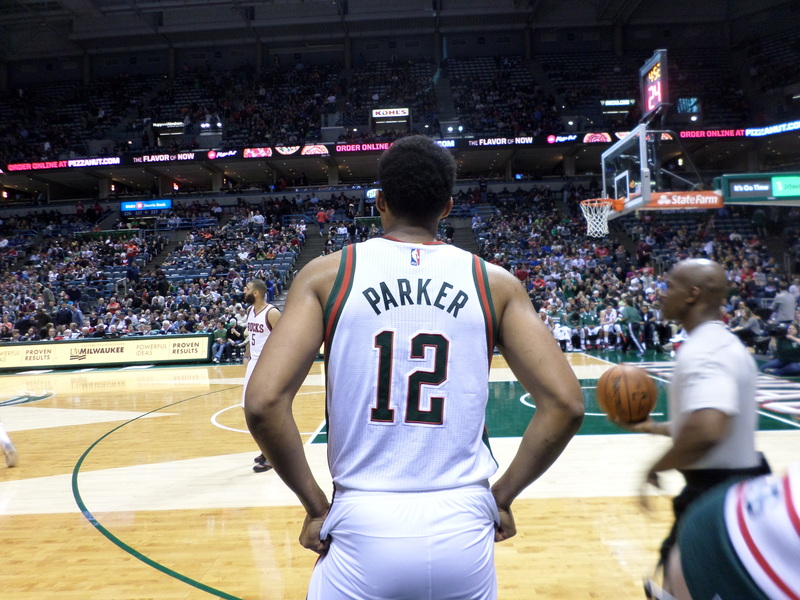 The Milwaukee Bucks have a healthy roster for the first time this season. Jabari Parker will return to the starting lineup tonight when the Bucks face the Cavaliers in Cleveland and guard O.J. Mayo will play for the first time this season, getting a clean bill of health from a hamstring injury. 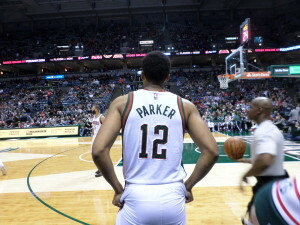 Parker missed Tuesday’s game at Washington due to a sprained right foot but rejoined the team in Cleveland yesterday. Mayo hasn’t played in the first 11 games after suffering a hamstring strain in the final preseason game at Minnesota. The Bucks are 5-6 after their 115-86 loss to the Wizards on Tuesday night. They beat the Cavaliers in their first meeting, a double overtime game in Milwaukee on Saturday night. The Bucks bench has been outscored for much of the season and Mayo could help boost that bench production with his return. The Milwaukee Bucks opened some eyes around the NBA last night, marching into Chicago and doing what most thought they couldn’t, beat the Bulls 94-88 at the United Center. After trailing 3-0 in the series, the Bucks have won two straight to cut their Eastern Conference series deficit to 3-2 with game 6 back in Milwaukee on Thursday night (6 p.m.). After the Milwaukee Bucks defense forced yet another Chicago turnover, Jared Dudley found Jerryd Bayless with an inbound pass that resulted in a game winning lay-up and a 92-90 victory over the Chicago Bulls at the BMO Harris Bradley Center. The victory sends the series back to Chicago for game five of the series on Monday night. Khris Middleton stole the ball from Derrick Rose and while Middleton was attempting a half court shot, Bucks coach Jason Kidd was in the ear of a referee, shouting for a timeout. He got it, with 1.3-seconds left. Kidd drew up the game winning play and his players executed to perfection. The Bucks pulled out the victory with veterans on the floor. They ended a nine-game playoff losing streak, dating back to their first-round series against Atlanta back in 2010. O.J. Mayo, who hit a big three with 1:42 to play, led the Bucks with 18 points. Dudley finished with 13 and Bayless 10. Mayo also hit 4-of-6 from beyond the arc. Dudley was 3 for 4. The Bucks forced 28 Chicago turnovers, which led to 39 points. Jimmy Butler scored a career playoff-high 33 points, but the Bucks defensively held the rest of the Bulls in check. Pau Gasol had 16 points and Derrick Rose 14 points for Chicago.